A lamp specially designed as a basking spot lamp. The tight beam can be directed precisely on an area to create a basking site. 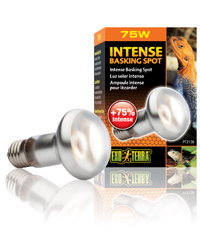 The heat and light in the beam is increased by 35 percent, allowing greater distances between the bulb and the basking site. The UVA (ultraviolet A) light contributes to reptiles' physiological well-being.